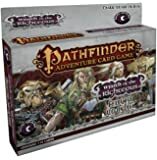 Buy Pathfinder Adventure Path: Wrath of the Righteous Part 4 - The Midnight Isles Brdgm by Greg A. Vaughan, James Jacobs, Paizo Staff (ISBN: 9781601255853) from Amazon's Book Store. Everyday low prices and free delivery on eligible orders. Character illustration for Pathfinder Adventure Path 76 �The Midnight Isles" (The Wrath of the Righteous), Paizo Publishing.